LONDON, Sporting Alert – Diego Costa will start for Chelsea in today’s English Premier League opening game against Swansea City at Stamford Bridge. 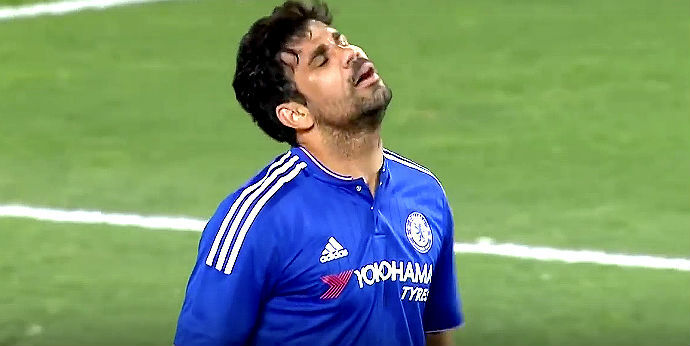 Costa had been questionable for the game with a hamstring injury he picked up during a preseason friendly game last month and there were suggestions that he would have been rested. However, the team sheets are out and the Spanish forward’s name is listed, which means he will take up his place up front for the defending champions. Both Radamel Falcao and Loic Remy are on the bench for Jose Mourinho’s side and the pair could see some action with Costa not expected to play the full 90 minutes. Also starting for Chelsea today are Eden Hazard, Cesc Fabregas, Willian and Oscar, with Nemanja Matic holding thinks together in front of the back four of John Terry, Gary Cahill, Branislav Ivanovic and Cesar Azpilicueta. Available on the bench alongside Falcao and Remy are the likes of Asmir Begovic, Kurt Zouma, Ramires and Victor Moses. Meanwhile, for Swansea City, Bafetimbi Gomis will lead the attack for the visitors, with summer recruit Andre Ayew also starting against the champions. Gylfi Sigurdsson, Jefferson Montero, Kyle Naughton, Federico Fernandez, Ashley Williams, Jonjo Shelvey and Sung-Yueng Ki all start as well. Among those available on the bench today for Garry Monk are Franck Tabanou, Wayne Routledge, Eder, Angel Rangel and Jack Cork. Swansea City defeated Manchester United 2-1 in their English Premier League opener last season and the visitors will be hoping for a similar result against Chelsea a term later.